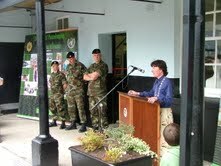 The official opening of the new military museum at Columb Barracks, Mullingar took place on Sunday 27th September. This event coincided with the ‘Discover Mullingar’ programme of events that took place around the town. The new museum is located in the old guard room adjacent to the main gate. It is a most suitable location, as thousands of soldiers of differing race, creeds, uniforms and corps, have toiled in its hall and cells since it was built in 1815. This is also the very building in which the legendary Gen Sean McEoin, ‘the blacksmith of Ballinalee’ was incarcerated in March 1921. This followed his arrest at Mullingar train station by British forces. As he was being escorted to the barracks he tried to escape but was shot and wounded before being locked up in the main cell of the guard room. He remained incarcerated here for a number of days under the care of a Dr Karney, before being transferred to Dublin for trial. It’s not difficult to imagine the many less celebrated poor souls that have also been incarcerated in the same cells over the years. The purpose in creating this museum is to honour the great tradition of soldiering that has always existed here in the garrison town of Mullingar. Not only since the occupation of the post by Irish forces in 1922, but we also acknowledge the service of the preceding British soldiers, who garrisoned this barracks since 1815, many of them Irish and indeed many natives the town. Many of whom were to lose their lives on far away battlefields. 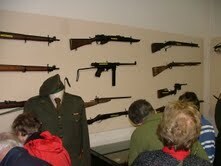 This focus of this museum is distinctly local, celebrating the many soldiers of Co Westmeath. 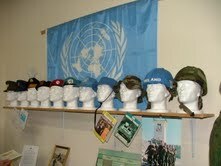 In particular it recognises the long standing and unique integration of the military into everyday life in Mullingar. In addition to a fine display of weapons and swords, the museum also has a rare officers dress uniform and cape, dating back to 1930, which belonged to Col Joseph Dunne, who had been a member of the military mission to the United States in 1926. A British army officer uniform from circa 1920 is thought to have belonged to Lt Col J.O.E. Vandeleur, who was later played by Michael Caine in the film ‘A Bridge too Far’, is also on display. 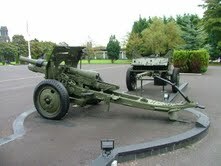 A Brant 120mm Heavy Mortar which saw active service in the Congo supporting operations in Katanga in late 1962 and early 1963, takes pride of place on display. Many historic photographs, some dating back to the 1870’s, adorn the walls of the museum. The old guard room has been restored in a sympathetic manner. Sgt Eric Craig is the museum curator, for security and other reasons viewing is restricted to by appointment only basis.